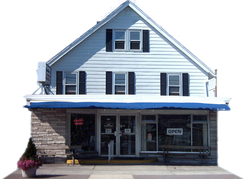 Going to Mueller's Bakery on a summer morning has been a tradition for generations of residents and visitors to the charming, resort town of Bay Head at the Jersey Shore. Bay Head's pedestrian-friendly streets make it a favorite for day trippers as well - all year long. Locals and vacationers alike can vouch for the long-standing traditions of waiting for their Sunday crumb cake, or placing their holiday order to ensure they get their favorite holiday baked goods, year after year. Since 1890 Mueller's has evolved as far as modern baking is concerned, while holding tight to the old-fashioned appeal of yesteryear where service, quality, product and atmosphere exist in a storybook-setting town. The signature product of Mueller's has to be the crumb cake. The original formula is still used and hoards of people come from near and far to get Mueller's crumb. It is shipped all over the world for those who have to have it and can't find anything comparable locally. Shipping can be arranged in-store, over-the-phone, or online. Mueller's is open from mid-February through December. Make it a point to come out and visit and you'll soon make that visit to Mueller's a tradition of your very own!